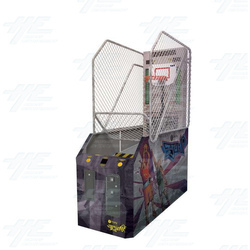 i-Jump Street is a Basketball Arcade Machine which is fun for players of all ages. This street basketball motif for the cabinet art creates an unique version of this classic sports game for players to enjoy anew. i-Jump is an arcade basketball shooting game with a 'street' theme. Player's skills are tested by the vertically moving hoop in the three phases of gameplay.